The first round of the 2015/2016 Summit Racing Equipment Sportsman Series fired up yesterday with qualifying for the Desert Nationals at Alice Springs Inland Dragway (ASID). Craig Geddes (Super Comp – photo below), Darren White, (Supercharged Outlaws – at left), Simon Barlow (Modified), Vlado Turic (Super Sedan), Shane Walker (Modified Bike), David Jarred (Super Street) and Kelly Donnelly (Junior Dragster) all top qualified following four sessions. ASID already holds two National records and if Geddes can run within one per cent of his qualifying time during eliminations, he will reset the eight-mile record for the B/D class. Steve Norman is currently over the C/APA National record reaching 135.95 mph, Kim Fardella recorded a speed of 128.57 mph to go over the D/G National record and David Dequen went 143.31 mph to go over the E/AA National record, meaning ASID could hold another four national records by tonight. Geddes and Norman head the field from Kim Fardella, David Dequen, Central Australian Drag Racing Association President Mark “Yak” Probst and Johnny Ienco. 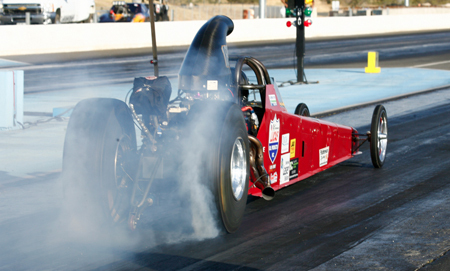 Sandgroper Darren White overcame an early setback when his Dodge Dart sent an ominous smoke billowing into the atmosphere, but his team regrouped and eventually set the standard in Supercharged Outlaws. White’s 4.502 ET was just one hundredth of a second ahead of former Champion Doina Day who qualified second. Following White and Day in the top two, Mark Kuhn qualified third from the Territory’s Andrew Cole and Troy Wittwer. Alice Springs’s own Dan Hodgins experienced mechanical trouble and will be unable to take the field. Simon Barlow spearheads the Modified bracket into race day from Matt Forbes, Simon Lekias, Bradley Hicks, Craig Baker and Andrew Armistead. Vlado Turic qualified first in Super Sedan from David Yanko, Neville Beyer, Marko Tolomeo, Doug Slade, three-time Aussie champ John Kapiris, Darren Mallison, George Tipouikidis, Mike Brideson, Brett Matthew and Geraldine Willox. Tasmania’s Shane Walker topped Modified Bike from Brian Hotker, Gordon Crawford, Brian Moore, Don Baird, Wayne Patterson, Malcolm Price, 2014 Desert Nationals winner Bryan Finn, Derryn McGregor and Greg Oberti. David Jerred heads Super Street followed by Craig Caton, Matthew Smart, local boy Malachi McMurtrie, Michael Bridges, Harry Harris, Paul Garbellini, last years’ winner Kylie Tanner and locals Conan Latham and Christine Jackson. And finally in Junior Dragster, Kelly Donnelly is number one from Michael and Brayden Naylor, Andrew Shirley, Alanah Cope, Josh Baker, Lathan McNicoll, Sarah Donnelly, “The Real” Tim Baker, Brodie Zappia, Daniel Carranza and Cadence McNicoll. 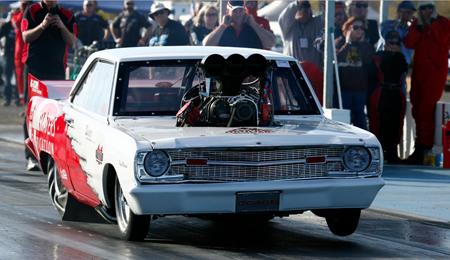 Eliminations for the 2015 Desert Nationals start today at about 11am.